In Ivory Coast, A Revolution Also Rises : Blog Of The Nation Though headlines focus on the turmoil in Libya, Ivory Coast is also on the brink of civil war three months after the November elections. 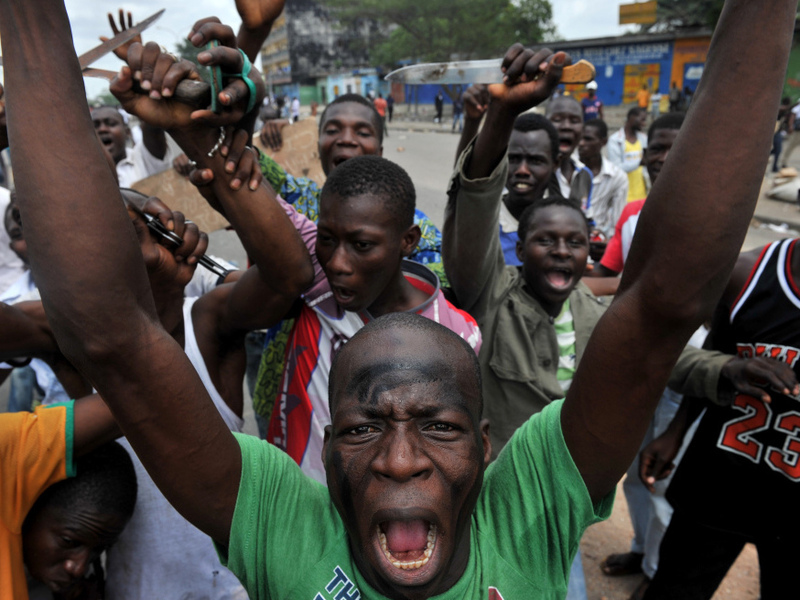 Last week, the situation escalated as violence exploded in the capital, Abidjan. Residents gather on the street where security forces loyal to disputed incumbent leader Laurent Gbagbo, opened fire on demonstrators, killing at least six women on March 3. Though the headlines of late have mainly focused on the turmoil in Libya, Ivory Coast is also on the brink of civil war. Fighting has continued since the elections on November 28, where Alassane Ouattara was internationally recognized as the winner over incumbent leader Laurent Gbagbo. Over three months later, Gbagbo still refuses to concede. A month after the elections, we talked with NPR foreign correspondent Ofeibea Quist-Arcton about what a civil war in Ivory Coast would mean for the region. There's a real fear in West Africa that if Ivory Coast - which used to be this oasis of stability, prosperity and peace in West Africa - if it really goes to war, it could be very, very bloody indeed - and of course, spill over the borders and destabilize the whole region. We don't want any differentiation in the treatment of this crisis. They're the same thing... they're using war weapons to kill peaceful civilians. So that's the responsibility of the international community to protect the civilian. The U.N. reports that 400 people have been killed since the elections, and some other agencies suggest that estimate may be far too low. So even though a vote was held, and a winner was declared and backed by the international community, the African Union and Ivory Coast's neighbor's, violence and unrest still persists months later. With this situation continuing to escalate, one can only wonder what lies ahead for the North African countries struggling to start fresh. In December, Quist-Arcton summed up the desires of the Ivorian people in a succinct statement: "They just want their political leaders to make peace and propel this country forward." From the Middle East, to West Africa (and maybe even in Wisconsin and Ohio), I think there are a lot of protesters with that same longing right now.